There are all these interesting chess interviews that make you feel so happy about chess. Here's one such interview. Our question is - ever played a chess game that took two years to finish? Howzzat? Read on to find out! A grand master always stays ahead of the game in his strategy, writes LEE MATTHEWS. A chess grand master can literally see the future. It's not crystal-ball gazing; no fortune-telling hokum. What a chess grand master sees, spread out in the mind's eye, is simultaneous visualisations of what's going to happen on the chess board if this piece moves here, that piece moves there, then another piece shifts somewhere else. It's a different logic chain for every move, every piece on the board. New Zealand's correspondence chess grand master and across-the-board fide master Mark Noble, who recently moved to Feilding, says the skill for any chess player to learn is to foresee what's going to happen, regardless of what move is made. "It's complicated. At the beginning of every game, the opening move, white has 20 possible moves. Black then has 20 possible replies. So that's 20 times 20 possible combinations just in those first two moves. "Second move and reply, it's up to 30 possibilities for each colour. Keep that up, and you're suddenly looking at a lot of zeroes, very quickly." Many possible moves are quickly eliminated, but Noble works 10 or 12 moves in advance in his mind, knowing what will happen if any piece anywhere moves in any order. It's about recognising patterns, having a plan, and being able to rapidly change that plan if something goes against you. He tries to set up what he calls his "pet lines" – game strategies where his moves drive the other player into a mistake, or into the trap he's setting. "If you can make the game move along one of those lines, you know the strategy, you know all the tactics for it. You're playing to a logical conclusion. And if your opponent doesn't know what you're doing, they have to make the perfect move every time to evade the trap." But chess is too complicated, with too many variables, to ensure these pet lines happen every move, every time. There's always potential for surprise, for being out-visualised and out-thought. Noble's the first correspondence chess grand master in New Zealand history. 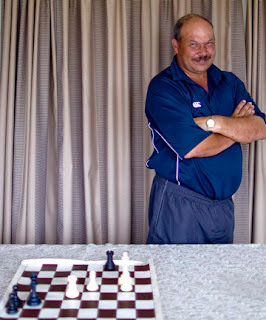 He won the rank in 2010, after playing chess for 36 years. Murray Chandler was the first Kiwi over-the-board or face-to-face grand master, who won the rank in 1982, playing for England. Both got their start at the Pencarrow Chess Club in Wainuiomata, coached by Brian Foster, who ran Sunday afternoon junior classes. "I'm 49, Murray's several years older than me. He was already New Zealand champion when I started playing ... he went to England and played over-the-board for England for 30 years, got his grand mastership there. New Zealand's really too small to have enough competition at the top level." Noble started chess at intermediate school, and the game was useful therapy for what happened next. Aged 13, he was hit by a car and his left leg was severely damaged. He was in hospital for months, underwent a series of operations, and he actually won the Pencarrow club's C-grade competition from his hospital bed. It gave him a taste for correspondence chess – a good sport for a lad who loved lots of sports, but who walked with a limp. Chess also further honed his photographic memory; he can recall pretty much every game of chess he's ever played, move by move. "It helps if I write the moves down in a chess book; the writing helps me remember it better. But I'm hopeless with names, I could meet you down the street next week and I'll look at you blankly, sorry." He says computer technology and the internet have revolutionised correspondence chess. "In the old days, it took years, I think 20 years was the limit for a game. If I was playing somebody in Russia, I'd post my move to him, and it would take six to eight weeks to get there. He'd think about it, post his reply back ... four months to make a move, three moves a year. The longest posted game I ever had was probably nine years ... very drawnout, and expensive in stamps." Technology has speeded up the exchange of moves, taking out letter travel time. An internet correspondence game now allows 50 days to make 10 moves, which sounds a lot of time, but isn't. "It takes about 10 hours of thinking, real thinking without distraction, to fully visualise a move. I can get a five-hour bracket between 8pm and 1am, so that's two nights to think through a move." Even so, it can take two years to finish a game. He's currently playing 130 correspondence games at once. Fourteen of these games are in the current Chess World Cup. "There's World Cup, and World Championships. I'm playing in the 15th World Cup now, and I've qualified for the 20th World Championships, they're playing the 19th ones now. Both correspondence." Correspondence chess suits him better than over-the-board. He's a fide (or third-level) master in over-the-board, and he's working to improve that. The problem is the time required for over-the-board competitions. Two weeks to qualify, another two weeks of games at a national competition, then more time overseas battling up the seeding order. "If you have to work, have a life with children and obligations, it's hard to find that sort of time." He works part-time for Idea Services (formerly IHC), and he's slowly developing work coaching chess in schools. Feilding Intermediate, led by principal Stu Trembath, last year decided to introduce chess as a brain-training tool. Mr Trembath says his staff report that chess players' thinking and problem solving is noticeably in advance of children who don't play. "To be a good chess player, you have to be patient, you have to visualise what's going to happen, you need tactics and strategy, you need to prepare for what you're doing. Those are good skills," Noble says. He'd like to see all 5-year-olds introduced to chess as soon as they start school. "Teach them how the pieces move, and when they get confident, start playing seriously with them. Take their pieces as they make mistakes. You'll see their thinking develop with every game." That developed thinking gets applied to everything the chess-trained child does. "I just think if you get kids going with this, they're going to succeed in other things as well. I'm not looking to turn out 300 champion chess players from a school, I just want to see the thinking happen in all their areas." He teaches children to control the middle of the board, and the crucial moves in a game are probably moves 12 to 20. "Think of the middle of the board as a hill, with a war being fought up and and around it. Get to the top of that hill, and you'll win, that's elementary battle tactics." His study is set up with a computer, with chess books and a board and pieces handy. There's a shelf loaded with championship trophies, and a packet of pineapple lumps to satisfy the snack attack during late-night thinking sessions. Noble also plays lawn bowls, has joined Palmerston North's Northern Bowling Club, and recently, with Manawatu international Sharon Sims, won the centre title mixed pairs. He says there's many similarities between bowls and chess, similar thinking and tactical play, trying to force the opponent to certain sequences of action. "The thing about chess is that there's always something to think about. The game's as old as humans, it's gone on forever, and it's never been mastered. The best player in the world still gets beaten when somebody else out-thinks them ... and you only learn from your losses." Computers as chess opponents are hard to beat, but in certain circumstances the human brain still out-think it. "Computers don't handle an unbalanced game very well; you get four pawns on one side of the board, for instance. The logic they use can't compute it correctly, somehow. We can. And using computers, well, it defeats the point of using your own brain."